Map Dimensions: 33 inches tall x 54 inches wide. Click here for more detail. 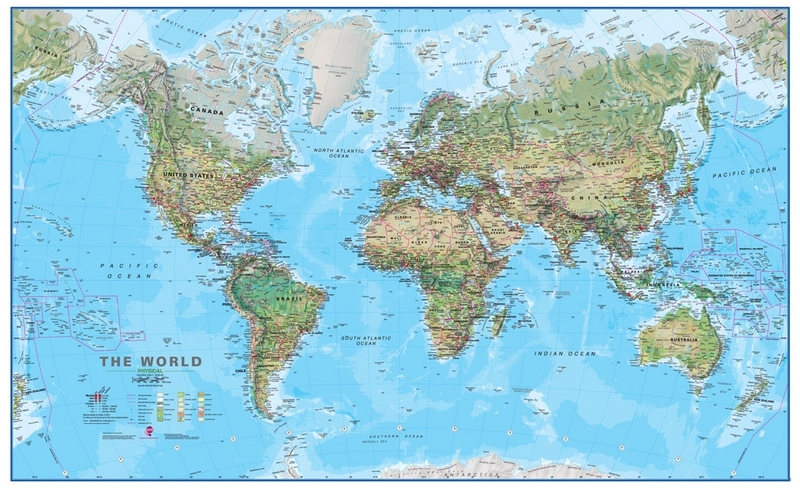 The Physical Map of the World is a durable laminated wall map that is perfect for schools, offices, homes, or anywhere that a physical map of the world is needed for education, display or decor. It presents the world's land and sea floor features in a beautiful and colorful display. We are able to offer it at an attractive price because it is produced in large numbers. Whether you want to use it in your office or classroom, or instantly add sophistication to your den at home, you can't go wrong with this classic map! The major physical features of the land are shown with terrain shading. With just a glance at the map, the Rocky Mountains, Appalachians, Andes, Urals, Himalayas, Alaska Range, Atlas, the Alps and others are standing up in shaded relief. You can also see the Great Rift Valley of Africa and fjords in eastern Greenland. If you look a little closer, you will see the Coast Range and the Sierra Nevada of the western United States along with the Sierra Madre Occidental and Sierra Madre Oriental in Mexico. All of these mountains are shown in relief and labeled by name. This level of detail is repeated in other parts of the world. If you look closely you can also find dozens of volcanoes shown with a triangle symbol and labeled by name. These include Mount Rainier, Popocatepetl, Volcan Baru, Chimborazo, Kilimanjaro, Fuji, and dozens more. Land environments are shown on the map using a color pattern scheme that marks (where these features are large enough to depict) tundra, glaciers, mountains, coniferous forest, mixed forest, rain forest, savanna, grassland, steppe, desert, lava fields, mangrove, arable land, marshland, salt lakes, salt deserts and intermittent lakes. With one glance at the map you can immediately see broad areas of the world that are desert, forest, mountains or ice. Ocean depths are shown as five progressively darker blue colors. Light blue areas near the coastlines show shallow water and the approximate extent of the continental shelf. Four progressively darker blues show increasing depth with the darkest blue color marking the deepest ocean trenches. Hundreds of islands and depth sounding locations are marked throughout the major oceans. Major rivers are shown as dark blue lines. Major inland lakes and seas are shown using the same color depth shading as was used for the oceans. Major cities and capital cities are marked with red symbols that reveal their relative population. Within the United States, state capital cities, major cities and state boundaries are shown. Throughout Canada, major and capital cities are shown, along with province boundaries. The highest mountain on each continent is marked, along with a few other significant mountains. The map shows the the world at an equatorial scale of approximately 1:30,000,000 in a Van der Grinten projection. This projection prevents severe distortion of geographic features as the poles of the earth are approached and causes the lines of longitude to converge at the poles. Lines of latitude remain as parallel horizontal lines. Extreme polar areas are not included on the map.